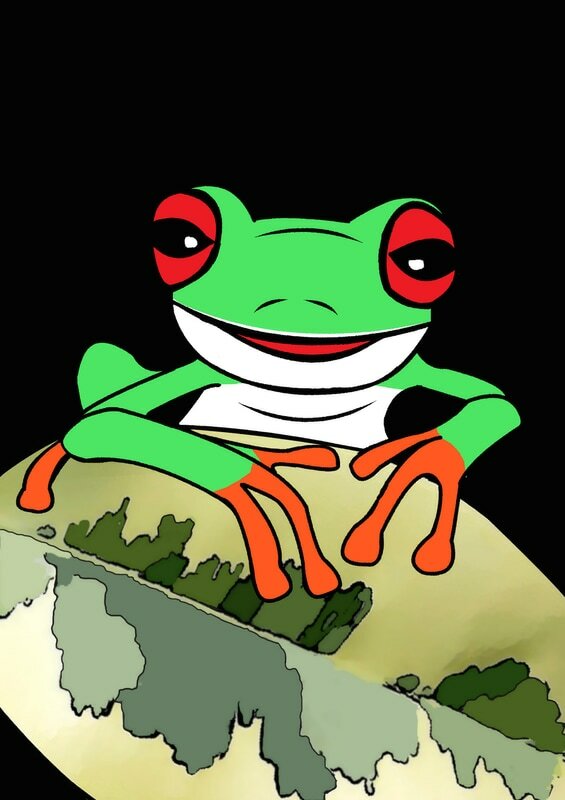 An animated series about a colony of daring leafcutter ants, with some innovative new ideas about how to make their Amazonian colony a better place. A small colony of leafcutter ants has set up an “alternative” civilization in the Amazonian rainforest. These ants have some crazy new theories about how to organize their society. 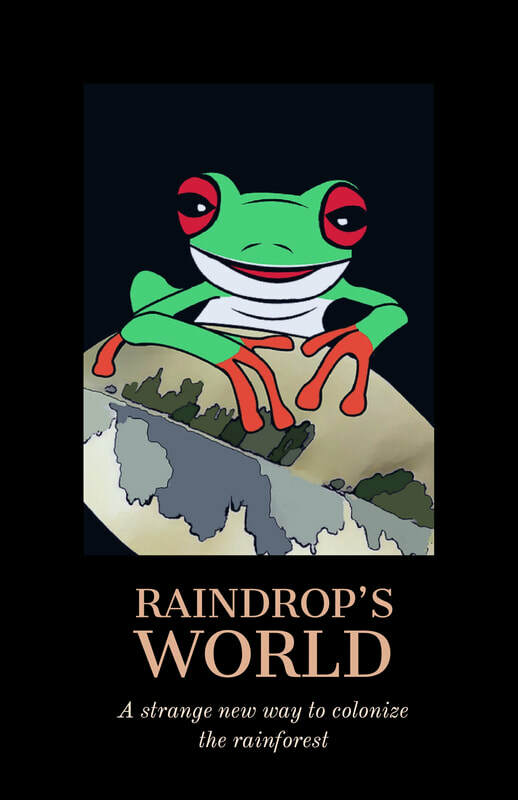 Raindrop, the protagonist of this animated series (age 3 and above), is an inquisitive young female with the temperament of a rebellious eight-year-old girl (the human variety). The wilder aspects of existence captivate her imagination, filling her with wonder, and sometimes a little dread, although she sees the grander design of life, and the beauty of the forest on display. Leafcutter ants are vegetarians. Their names are derived from the natural world. The name “Leaf’” is very popular. 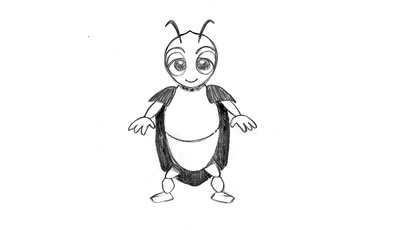 Some of the females wear their antennae up like hair, tied back with nets and scarves. On special occasions, the adults don decorative body paint (war paint, weddings). 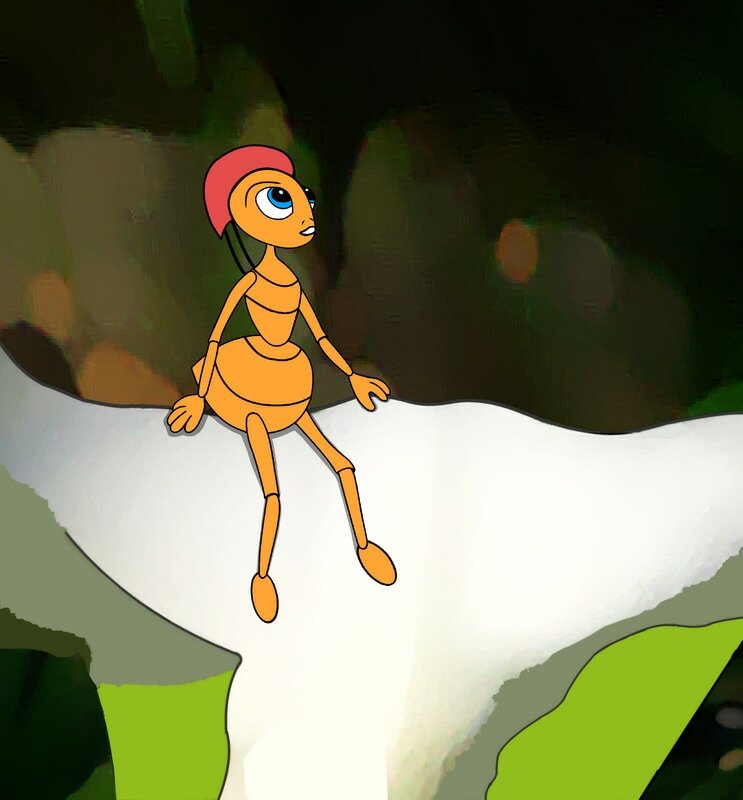 RAINDROP is a precocious little ant, completely in love with the natural world surrounding her. She stands up to bullies (often unsuccessfully) when she can, and frequently pushes her friends to venture out into the rainforest with her — sometimes against their better judgment — expecting them to be as enthralled with the unknown as she is. LITTLE CLAY is new to the world of ants. 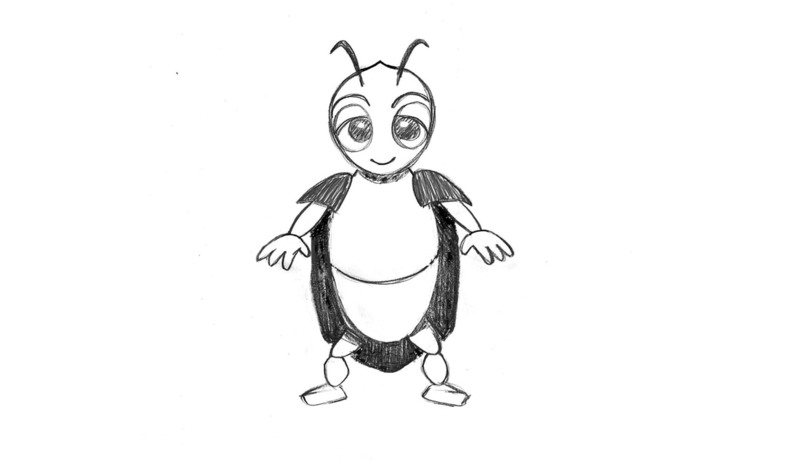 He’s a young dung beetle with a noble heart, come to learn the ways of the leafcutters. 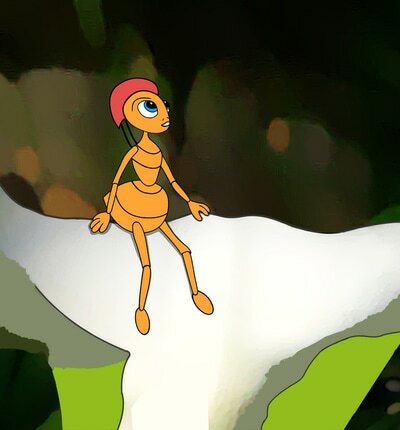 Clay is outgoing and loves to sing, but this strange new "ant" world makes him question his beliefs. He loves rolling things up into balls (the need is almost an addiction), but sadly, rolling dirt, leaves and mud into balls is frowned upon by the leafcutters. POLLEN is an exceptionally beautiful ant, loyal to a fault, and only vaguely aware of the effect her beauty has on other ants. She's wide-eyed and inquisitive, but can also be incredibly shy. When she’s embarrassed, her cheeks redden and she suffers from uncontrollable hiccups, although she somehow manages to maintain her graceful poise. THE GURU is a red-eyed tree frog who lives at the top of a giant Kapok Tree. He espouses wisdom in the form of riddles and enigmatic sayings to all who dare climb his tree, although his devotees don’t always grasp the hidden depths of his obscure messages — and quite often misinterpret him entirely. TREE BARK is a bullet ant. This helpful and courteous adventurer has set sail on a small twig boat to see “the world.” He wears an eye patch, despite having two very good eyes, and often alternates his patch between sides. Tree Bark shipwrecks near the leafcutters’ colony, and they take him in and help him convalesce. PAPAYA, Raindrop’s father, is good-natured and affectionate. He always wants the best for his daughter. And even though he’s positive and supportive, he’s a hopeless dreamer too, often making a mess of things when he's distracted. LILY, Raindrop’s mother, is a neurotic jumble of nerves, worried about accidents, anteaters, floods and lightning. She's a true hypochondriac when it comes to her family's health, especially Raindrop. 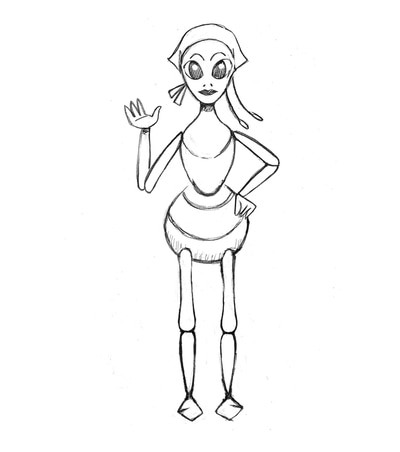 NANA LIANA is not only Raindrop’s grandmother, but she’s also a former queen and the mother of the current queen — therefore mother or grandmother to most of the ants in the colony. Her face is wrinkly, and she uses a twig cane to walk about. Sometimes she thinks she’s still queen, and blurts out inappropriate remarks. In fact, Nana Liana doesn’t understand this younger generation at all — and don’t get her started about caterpillars and moths, creatures she absolutely loathes. Additional Characters: Amber & Orchid (the twins), The Dung Beetles, Bida-Bida (the confused finch), Green Leaf (the schoolteacher), Ana (the anaconda), Mulch (the bully), and many more!